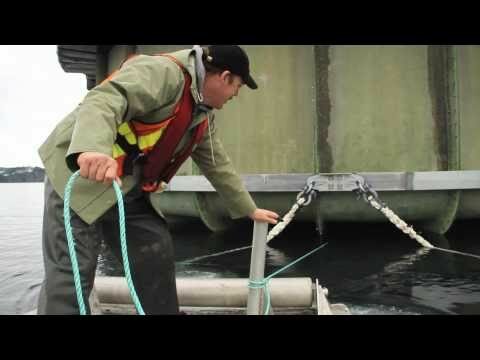 Building the Future of Salmon Farming...In 90 Seconds! On January 14, 2011, Agrimarine Holdings Inc. completed primary construction and installation of the world's first marine closed-containment salmon farm (it has several freshwater-based tanks already in operation in China) at Middle Bay, near Campbell River. The event was the culmination of years of research to develop a more sustainable form of salmon aquaculture that - unlike the open net pen farms that dot BC's coast - doesn't dump its waste into the marine environment, and will minimize the transfer of parasites and pathogens between farmed and wild fish. Damien Gillis has been documenting the construction for Agrimarine and here condenses a two-week process into this 90 second time-lapse video. The tank's fibreglass and steel base is first mounted on a barge - which is then temporarily sunk in order to float the base. The buoyant base is pulled to the dock by tug boat, where the construction team begins bolting 24 fibreglass wall sections atop it. The completed tank is then tugged into place off the dock and attached by eight heavy-duty ropes to an underwater grid anchored to metal piles. Once secured, a 12-inch plug is removed from the bottom of the tank. Over the next two hours, water fills the tank as it sinks until mostly submerged. The top of the tank is suspended above the surface by foam-filled flotation cubes, attached beneath the top ring of the tank. The company is now set to fill the tank with a first batch of Chinook salmon, and will soon be adding three more tanks to its Middle Bay operation. Looks like a pretty bleak future. Hold on, why is this tub more sustainable? I'd love to hear some more information on the new technology. It still takes over 2 kilos of "feed" to generate 1 kilo of farmed Salmon. "Feed" is another word for bait fish, sardines, herring, etc, caught through unsustainable factory fishing in large part off the coast of Chile, leading to the collapse of the local marine environment. With global demand for seafood peaking this year, projections still point toward 2050 as a complete collapse of the global fishery.